Our summer is being taken up by our home renovation, and while we may not be soaking up as much sun as we want, we're at least getting our fill of summer flavors, and trying to grill all of the things before we blink and it's fall. I love pasta, even more since I discovered there's fresh GF kind at our local grocery store, and especially when it's spilling over with vegetables. We had a craving for said fresh pasta this week. 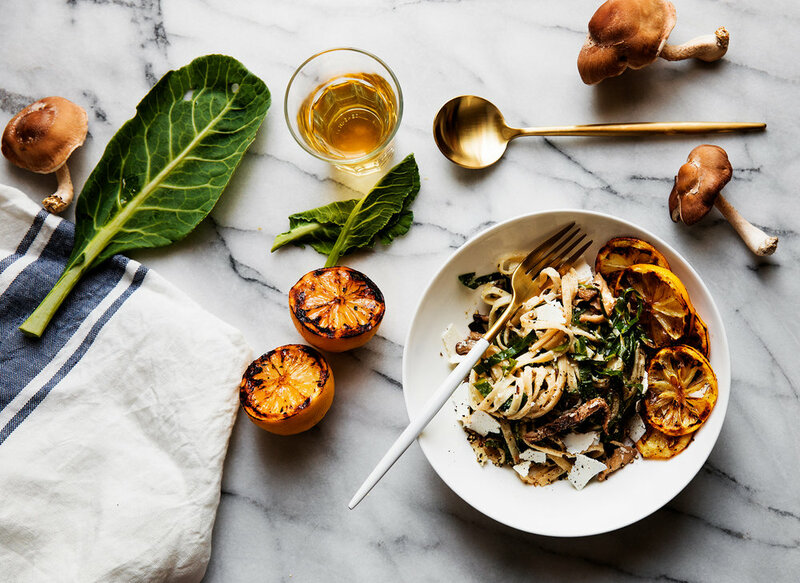 Our Fettuccine with Caramelized Onions + Swiss Chard recipe is a crowd favorite that we come back to again and again, (it's also one of the most popular recipes on Better Happier!) so we decided to adapt it for our current summer cravings. With tangy grilled lemon being the highlight, bitter collard greens, left with a bit of crunch, and ricotta salata mixed in and sliced thin on top make for a creamy and all around decadent dish. Using a shiitake and oyster mushroom combination gives a meatiness to compliment the collards, making it fit for vegetarians and carnivores alike. Split collard green leaves from stems. Combine leaves together and roll into cigar shape, chiffonade into thin strips by slicing cigar shaped roll-ups. Roughly chop and set aside. Cut one lemon in half and slice the other, set aside. Warm 1 tbs olive oil in a large skillet over medium heat. When oil is shimmering, add mushrooms and shallot, season with salt and pepper and cook, stirring frequently until mushrooms are browned and shallots are softened, about 4 minutes. Add 1 tbs butter and toss to combine and melt. Remove from heat and set aside. Clean skillet and warm an additional 1 tbs olive oil. When oil is hot, add collard greens, red pepper flake and season with salt and pepper to taste. Cook greens, tossing frequently until they are wilted and cooked down, about 5 minutes. Combine mushrooms with greens and continue to warm on low heat. Heat a gas or charcoal grill over high heat. Toss lemon halves and slices with 1 tbs olive oil and cook on grill until charred and grill marks are formed, about 4 minutes. When grilled, remove from heat and set aside. In a large pot, bring salted water to a rolling boil. When boiling, add pasta and cook until al-dente, about 5 minutes. Drain pasta (reserving 1 cup cooking liquid) and add to the skillet with greens and mushrooms. Gently fold in 4 oz grated ricotta salata and working in 1 tbs additions. Add pasta cooking liquid until cheese is melted and binds to pasta. Add remaining 1 tbs butter, stir to combine, and season with salt and pepper. Plate pasta, add a squeeze of lemon juice from grilled lemon half and top with shaved ricotta salata.